Last week my post about LinkedIn connection message proved useful to most, if not all of you, so today I decided to blog about another feature on the same social network – LinkedIn endorsement. It too can get annoying sometimes… here’s why and how to make the most out of it. 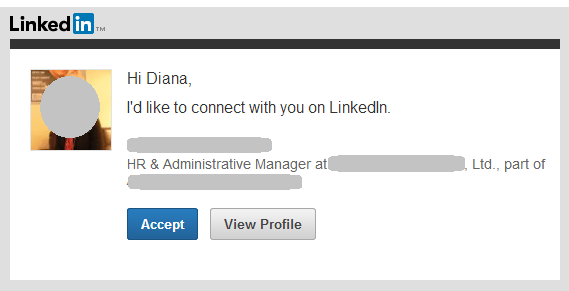 LinkedIn endorsement is a quick and easy way to support your connections. There’s no doubt about it. I believe LI team intentions were great when they introduced this feature to their users. But do we really use endorse on LinkedIn feature as we are supposed to? Getting such emails is just fine. What worries me is that most of the people who endorse me don’t know me personally and/or have not worked with me, ever. I bet some of them even don’t even really know what I do for a living. So, how could I trust someone’s endorsement for my blogging, for example, if I know they have never ever set their eyes on my blog? 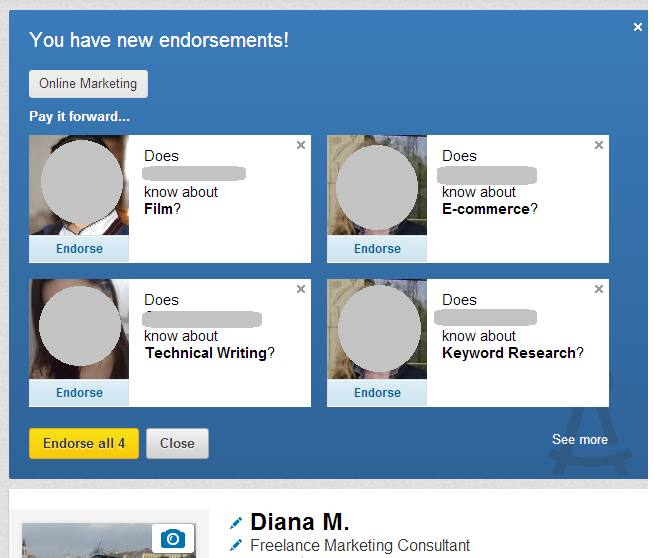 Abusing the endorse on LinkedIn feature renders it useless as a feature altogether. Knowing how I got my LinkedIn endorsements from all kind of people who know little to nothing about me, my skills and my work, I wonder – how can I trust the endorsements others have on their LinkedIn profiles? With one click you can endorse someone for a skill, or even 4 different people for different skills. Nice, huh? Well, it sure can be! LinkedIn endorsements can be a great way to support each other – if done the right way. LI endorsement suggestions often work based on the people you have in your network and the skills they have put on their profiles. So more often than not, you will be invited to endorse someone who you hardly know for a skill you have no idea if they have in realty! If that happens – stop! Don’t endorse them. Not because they are not good at it but because you do not know if they are good at it or not. Click on the endorse button for people you know and with whom you have worked. Endorse your connections for skills you personally know they are good at. Only by truly endorsing people for their skills (and not for numbers) we will be able to make the most out of “Endorse on LinkedIn” feature. 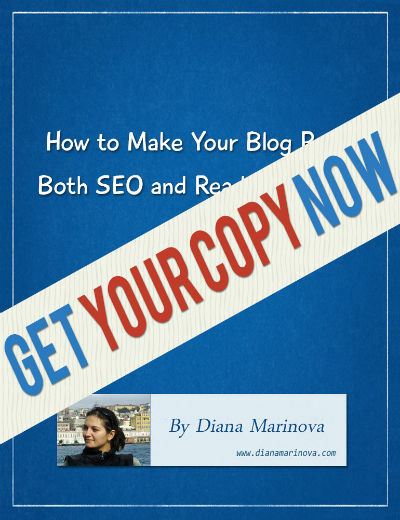 Hi Diana, thank you for your blog. This is also something that has been frustrating me recently as I’ve seen a rise in ‘reciprocal endorsement’ groups appearing around LinkedIn. The system could be so valuable but it’s really being taken advantage of at the moment, and it’s at risk of becoming meaningless. I only endorse when I feel the endorsee deserves it, and would never expect an endorsement in return – in fact, that would probably make me feel uncomfortable as I would feel I hadn’t ‘earned’ it! I will do a round of endorsements about every two weeks. Then the favor trickles back. Even though I don’t personally know many of my contacts, I do know them through their blogs. I would never give an endorsement I couldn’t be positive if it applied to that person’s skill set. That being said, lately I’ve received endorsements in tutoring, ghostwriting, and magazine writing (and from people who should know otherwise). I just quietly refuse to add those to my profile. Story of my life, Jeri! I get regularly endorsements about Google Adwords, event management and other things i really have no idea about… and from people who i even don;t remember how got on my network of connections in the first place. Maybe we should all start from there – changing the way how we connect on LI; and maybe then endorsements will fall into place as well. Thanks for stopping by! I use these practices myself. I read a lot about LI when I first joined it. I didn’t want to use it “wrong”. I always find it weird when I get endorsements from people I have not affiliation with. I will confidently endorse people if I know their experience. I believe in paying it forward but I won’t do it just because of numbers. Diana-I get endorsements all the time. I have no idea what to do with. Many are endorsing me for things I have no idea about. When I do accept the endorsement, then I am asked to endorse them or someone else. I feel funny endorsing someone for something I have no idea what they are good at. My question, What is the point of the Endorsement? Does it help with your website? Does it make a difference with Google? I would say if endorsements are used right, they can help you build your credibility as an expert on LI. But then again, “if used right” is the key… I never feel obliged to reciprocate endorsements… and call me stubborn, but i often message the people who endorse me for skills i don’t possess with a simple message “please, don’t endorse me for skills i don;t have, thanks!” or something like that. If not else, i make them think about their doings (i hope). I don’t think the endorsement problem will ever be fixed. The feature was broken from its introduction and was obvious intended to be broken so as to boost LinkedIn participation and faux networking. The problem with writing a recommendation is that you have to be familiar with the other person’s work and you have to actually write something. Too much effort. So they introduced endorsements. It’s about as meaningful as playing Farmville but it has less integrity because it’s used for lying and for asking other people to lie. hey, Diana! thanks for your comment and insights. I agree 100% with you. I LOVE recommendations feature on LI but i have always noticed that people don’t like it and use it much… not sure if it is because it’s too much effort or because they are like that “shy” to articulate their thoughts and praise somebody else’s good skills. I raised this point within my community at facebook. I am totally surprised to see people who solely know my name can endorse me for something. I really wish there is a way out for it or I would be forced to believe that most of the recommendations are fake. Even some people who are have pathetic skills ask you for a recommendation or recommend you just because they expect a return of favour with a recommendation. How do you actually deal with such people? What if your coworkers or friends ask for it when they don’t deserve it? 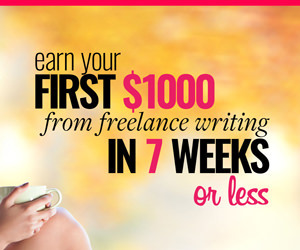 I find it hard to refuse but I’d love to know your personal experience on it. I am glad i don’t use it that often in fact i believe in one-2-one relationships so twitter is my personal favourite. Thanks for your comment, Nabeel! We pretty much discussed this over Twitter the other day but for the sake of my readers, will summarize here as well. It’s important to distinguish LI endorsements from LI recommendations. LI endorsements re heavily abused – LI recommendations are not – i should blog about this soon! I have no problem ignoring people who ask me to endorse them for no good reason. but i have never had a person who has asked me for a recommendation that he or she does not deserve. Usually, people who use LI recommendations use LI properly altogether – so they do deserve the recommendations they ask for – that is my experience in a nutshell. thanks again for stopping by and we’ll keep in touch! exactly, a potentially good feature ruined by false pretense and not so genuine intentions. Thanks for dropping by, Lili!